Sixty. Thousand … that is a 6 with five Zeros. It’s an incredible number. I feel so honoured and blessed. I am beyond grateful for your open mind, our open hearts, and your open ears to listen. 🚦 you don’t have to repost this flyer (only if you really, really want to help to SPREAD the word) BUT … please leave a comment and tag your best IG friend and why he or she is in need of a new mat, a wheel or an outfit 🦋. You can comment as much as you wish to but I ask you to mention only one IG handle per comment. Thank you 🙏🏼. Today, for the first time ever, I have secret questions for you. Please let me know if you had an aha moment over the past 5 days and if so when/what was it? Is there sth you didn’t like at all and why? Please check my sweet #IGbesties for their variations ⤵ Be mindful with your body and practice 👉🏼Be sure to check with my lovely Clare @clarerdubai for day 13. Don’t forget to do your warm-up and I recommend practicing Day.7 to Day.10 exercises. Then you can proceed to practice today’s pose. Please check my awesome #IGbesties & co-hosts for their variations of the day ⤵Be mindful with your body and your practice. You don’t have to tag all of us but please show some love to our epic sponsors along with using #March2💃5Poses in your post copy so we can find you. soooo, today we are combining the last days to one pose. I’d loved to write a bit more how amazing you all are. Captions on InstaGram are limited so I use it for the tips and cues hoping you don’t mind 🤗 I recommend practicing Day.7 to Day.9 exercises 5min every day. Please check my amazing #IGbesties & co-hosts for their variations of the day ⤵ Be mindful with your body and your practice. You don’t have to tag all of us but please show some love to our epic sponsors along with using #March2💃5Poses in your post copy so we can find you. ▶️ your feet almost want to lift on their own here. If this scares you lift one foot after another and bring your heels as close to your bum as possible. Eventually lift both feet, toes touching. ▶️ your focus point is ahead of you (30-50cm / 10-20in forward). Keep it! ▶️ Option 2: Bring your knees outside the upper arm as close to your shoulders as possible. Press your legs together. Remember yesterdays Garland Pose? Crow is no different from it except that you are on your hands here. Don’t forget to do your warm-ups. Do the exercises of Day.7 and Day.8. Then you can proceed to practice today’s pose. 🎥vid is 2x sped up. I looooved your Forward Folds yesterday. Practice this bend leg variation everyday and you’ll see your hammies soften soon. ❗️Don’t forget to do your warm-ups. Do yesterday’s ForwardFold every.single.day. You will surprise yourself how much your hammies will open up soon. Then you can proceed to practice today’s pose. Please check my sweet co-hosts for their variations of the day ⤵ Be mindful with your body and your practice. You don’t have to tag all of us but please show some love to our epic sponsors along with using #March2💃5Poses in your post copy so we can find you. Hammies, we are coming for you. And we make your quads working a lot. Personally I see FireFly more as a forward fold than an arm balance. For a nice fold you need to fit in your self. Like the first fold in #Origami 🎌 If the first fold is crap the following folds are getting worse. Today I want to see your knees bend and a flat back instead of straight legs and normally a rounded lower back. ▶️ Place your feet hip distance apart. Place your two fists between your big toes. Remember: Keep your legs bend all the time. Your quads have to work a lot this week which means that your hamstrings have to soften so you can lengthen them. Straight legs will come over time. Please don’t force it with compromising your lower back. … and *kabooooom* here it is .. the last and final day of an amazing week. It’s been an amazing time with all of you and I can’t believe my eyes when I see the tremendous amount of your little squares. I can’t wait to catch up on all your spectacular pictures, stories and simply the joyful squares. Thank you so much for all your shares, twinning creativity, laughter and love over the last 7 days! Our real life twins Regan and Jen are closing another amazing and heart warming twinning journey with a badass twisty handy magic!!! Today’s pose is all about getting on your hands and upside down. “Standing on your feet makes you feel you can be. Standing on your hand makes you feel you can do.“ I love this quote by my teacher because it describes perfectly how handstanding is „making” me capable! Check on Rey’s post for today for some alternatives and variations! 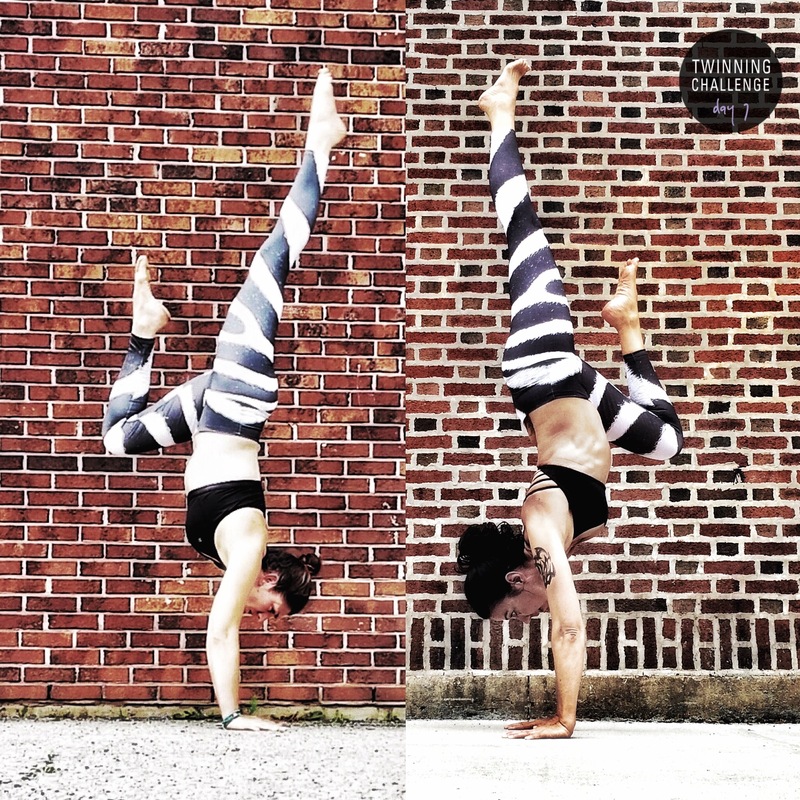 And if handstand is not in your practice, ask a teacher, use a friend, a wall, or whatever you like and do the variation that is right for you – no need for heroes. Tag at least one host and our epic sponsors along with using #TwinningChallenge in your post copy so we can find you (InstaGram only). Today’s pose demands a lot of hip openers … pigeon, garland pose, ankle2knee … and the twisty action is not to underestimate. So, chair pose with a twist, pigeon twist, half twist pose (Ardha Matsyendrasana) are very helpful with this. Kira and I went for the Humble DragonFly (or GrassHopper).